The NFL Extra Points Credit Card is designed for the NFL fan to earn reward points that can be exchanged for NFL tickets, merchandise and even VIP Pro Bowl Experience. You can choose your team design for your card as well. At this moment, this card comes with one of the best balance transfer deal available (15 months). 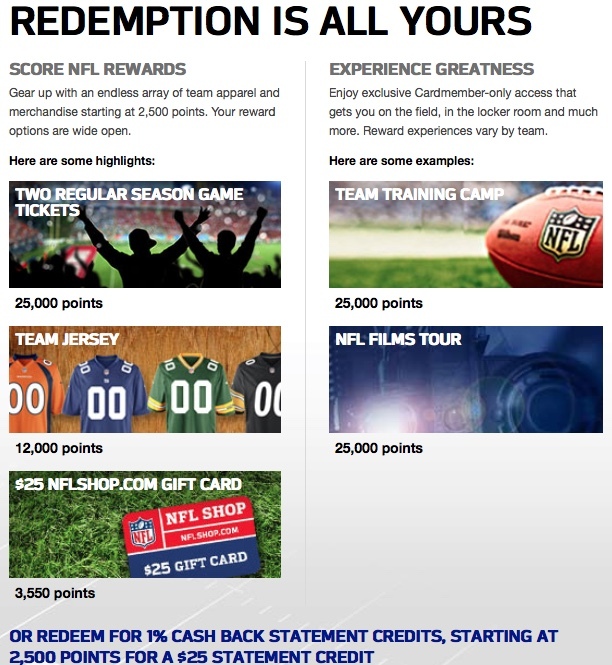 How To Earn Points - The NFL Extra Points Credit Card allows you to earn 2X points on "NFL and Team Purchases". This is defined as game tickets, at team pro shops, even in-stadium on game day. For other regular purchases, you can earn one point for every dollar you spend on the card. Reward points are valid for five years. How To Redeem Points - There are various ways for you to redeem the points that you have earned. The first way is to redeem for statement credit. For example, 10,000 points can be redeemed for $100 in statement credit. 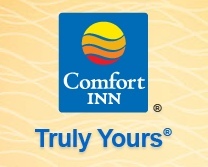 The minimum points you need to redeem is 2,500 points, which gets you $25 in statement credits. You can also redeem points for things like team tickets, team jerseys, NFL gift cards and things like training camp and tours. Sign up Bonus - New cardholders will get 10,000 points after spending $500 within 90 days. 0% Financing For Ticket Purchases - Cardholders can get 0% APR financing for six months when used to purchase NFL tickets over $500 in value. If you do not pay the full amount by the end of six months, you will be charged the usual interest rate. 20% Off NFL.com purchases - Using this card to purchase merchandise from nfl.com can also get you a very generous 20% discounts. Annual Fee and APR - The NFL Extra Points Visa has no annual fee. Balance Transfer Deal - 0% APR for 15 months (if transferred within 45 days of account opening). The table above shows the comparison of other similar "sports credit cards" like the MLB, NBA and NHL cards. They are all slightly different. The NFL card allows you to earn 2X points on NFL tickets and team purchases. The MLB card strangely only allows you to earn cash back on groceries and gas and not on any MLB purchases! The NBA card allows you to earn 2X points at supermarkets and gas stations and 3X points on NBA tickets and their online stores. They even give you 5X points for every purchase you make during all-star week and 2 weeks prior to the final! The NHL card is issued by Discover and actually resembles the Discover's regular IT card. As you can see, these cards are all different in their own unique ways. But having said that, I think these differences will not matter to most of you. After all, if you are a true NFL fan and want this card, comparing it with other sports cards is totally irrelevant. There are three main reasons why you would get this card. 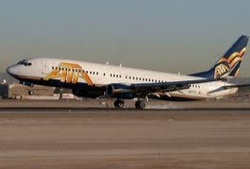 This first reason is that you are a huge NFL fan and want to get a credit card with your team's logo on it. And if you earn enough points and shop at NFL.com often, then this card would be worth it. Some of you might want to get this card for their 15 month balance transfer deal (if you do it within 45 days of getting your card). 15 months is definitely a great deal for a transfer. There are some of you who are rebuilders and would like to get a Barclays credit card and you are considering this card. In fact many folks look to Barclays Bank when looking for their first no annual fee unsecured card. Popular choices include the Apple Visa, NFL, and the BarclayCard Rewards MasterCard®. If you are thinking along these lines, I would urge you to consider the Barclaycard Rewards MasterCard® first as it is specifically targeted at folks with average credit. Tip: To increase your chances of approval with Barclays, you should preferably not have any recent inquiries on your credit report and you should have at least a year of history with another card on your credit report.